If all constellations in devotion view have the same color/opacity, then quite certainly hardware acceleration in your browser is turned off, if you don't turn it on or just prefer it being disabled, you are out of luck, sorry. Yes, you can see base skill levels for skills without bonuses from equipment — just hold [Ctrl + Shift] simultaneously. Yes, the values you see in game and in grimtools do differ, because by default grimtools shows average values (you can switch to min/max in options), and there's no way to show exact values that you see in the game. The tool always shows correct values for invested skill/attribute points, but the remaining point counts that you see are based on the maximum number of skill/attribute points that you can get in the game. If grimtools shows that you have some missing or extra skill/attribute points, then you either haven't completed quests for extra skill/attribute points or probably fucked up with some third party tools when editing your char, there's no other explanation. The site currently works in all modern browsers. IE < 11 is not supported for obvious reasons, it's somewhat working in IE 10, except for devotion view. So what is it and why not just use grim calc? 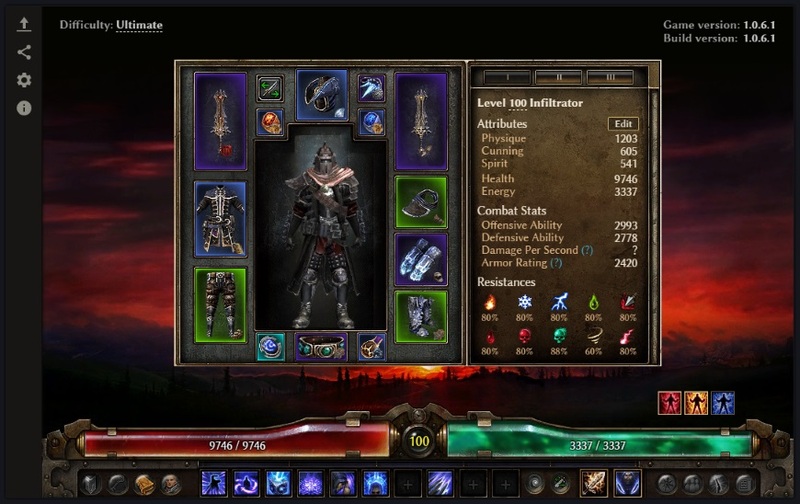 The tool allows your to customize any aspect of your character, including selecting equipment, masteries, skills and devotion, and at the same time being able to see all character stats calculated based on your choices. Basically you can do virtually anything related to character build, that you can do in the game itself, so it provides unlimited theorycrafting possibilities. You can always see current game version at the top right corner as well as "build version", the version of game for which the build was created. All builds are made backward compatible, so old builds will never be broken. You can view all character items by hovering over them, the tooltip can be scrolled using mouse wheel. The interface is exactly the same as in game, so you should be familiar with it. All character stats are updated automatically when you change items/skills/devotions. All stats are calculated for Ultimate difficulty, so its penalties are always applied. In future there will be a way to select the difficulty. DPS stats correctly account for dual wielding if the character has a passive that enables it. The tool provides an option to toggle on/off all buffs from items/masteries/devotion, the buttons are at the bottom right corner. The popup that shows up when you hover a buff button displays the list of skills for each category, but not cumulative stats. As you can see, there's a hotbar at the bottom of character screen. The UI is the same as in the game, you are able to select skills from the pool of skills from selected masteries and the ones granted by items/sets. Currently only one hotbar is shown, but I might add the second one too at some point in future. For each equipment slot you can select item/prefix/suffix/component/augment. Tight integration made it possible to use nice UI for that. You can immediately see combined item stats when you add a prefix/suffix for it. Search is the same as in Item Database, so you can use wildcards, search by regular expressions etc. All in-game restrictions are in place: e.g. you can't select affixes for legendary/epic items (well, there are couple exceptions) and you can't select augments for relics. Those of you who had an opportunity to use my Build Editor are already familiar with it: it's basically has the exact same UI as in game, so there's nothing to explain here. Hold [Ctrl + Shift] simultaneously to view skills without any bonuses from equipment. You can press [Tab] to switch to the next pet while the skill tooltip is being shown. Such skills also display spawn weight values. Currently the only skill that can spawn more than one pet is "Raise skeletons" from Necromancer mastery. It also migrated from Build Editor, but it was slightly revamped, it's zooming was fixed and top/bottom parts of the canvas aren't clipped anymore. The window looks similarly to the one available in game, and its functionality was mimicked, all restrictions are the same as in game as well, however failed requirements aren't shown at the moment (e.g. in game you can see the reason why you can't refund a point), but this will definitely be fixed in future. I admit that this window needs some QoL changes, but I think in it's current state it's much more useful than the one in grim calc. Left click on a star makes it active, if it's enabled; right click on a star reclaims invested point if there are no active dependent stars or it's the last star in constellation and removing it will cause one of active constellations to lose its required affinities. Currently all skill values are shown at max level, if for some reason you want to view skill values at level 1, hold [Shift] while hovering a skill. Clicking on a last star in constellation that has an attached skill (celestial power), allows to select the skill (be it from mastery or from equipment) to bind it to. Names of save folders for vanilla characters start with two underscores, for Ashes Of Malmouth expansion - with one. If you upload a character, all his attribute points / skill points / devotion points will be uncapped, meaning that they'll be set to maximum available values, including bonus points from quests. This was made to allow further theorycrafting even if you haven't unlocked all devotion points or haven't finished a quest that rewards a bonus point. After you've finished customizing your character, you can share it by clicking on the sahre button on the left bar (second from the top). After the build is uploaded you will be given a link to share the build. In the near future there will also be a BBCode with equipment/devotions/skills(?) so that you don't have to type all of it yourself when you write build description on forums. Tool API is kinda limited. Currently there are only 2 methods, one allows to get raw build data, e.g. This tool is built automatically from game resources.